The puzzle purse is made of four pieces of chamois, two of the pieces being merely flaps, one on each side at the upper edge. One of the pieces forming one side of the purse extends upward for about twice the height of the purse part. The part above the purse has a number of slits cut in it to make the width of each strip 1/8 in- These slits should be accurately cut in order that the purse may be opened easily. The other half is only the size of the purse proper. The upper edge of the latter piece and the flap on that side are stitched together to the flap on the opposite side, the threads of the stitches running between the strips of the long piece. These stitches are made on the line AB and around the edge. To open the purse, take hold of each side on the purse part and draw the pieces apart. 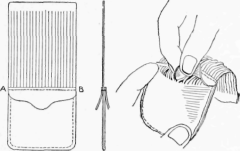 In doing so, the strips are drawn through the stitches so that they may be separated and a coin taken from the purse. A pull on each end will close the purse. - Contributed by Chas. Motton, Toronto, Ont.